A group of Model S owners proved last weekend that John Broders failed Tesla Model S road trip could have been a success. The question the last two weeks is, why did the NY Times writer John Broder fail in his Tesla Model S road trip, and did he fake the results to get a sensationalist headline? Last week a CNN reporter successfully replicated Broder's trip, and over the weekend a group of six Tesla Model S owners gathered to also replicate his trip. All of them not only succeeded in making the trip, but the individual Model S owners all drove the route twice to return home. The flap started almost two weeks ago when John Broder, an environmental reporter for the NY Times, attempted to drive a Tesla Model S from Washington D.C. to Boston using the Supercharger network to get there. A series of fiascos ensued and Broder had to abort the trip, capturing pictures of the Model S on a flatbed truck, starting a little media circus which at first blush harmed Tesla Motors' credibility. What was missed by many is the rookie mistakes Broder made, the most important of which was to not grab a full recharge in Milford Conn. Adding to the media circus, Elon Musk made a series of angry tweets claiming Broder had faked his results. Later last week he followed up those tweets with a blog post showing data gathered from data logs on the Model S driven by Broder, proving that he hadn't given an entirely truthful report. Then on Friday, a CNN reporter published a report showing he'd replicated the trip Broder failed to complete, and not only had plenty of power for the trip, but that he had so much energy to spare he could have fun with the Tesla Model S acceleration and speed. 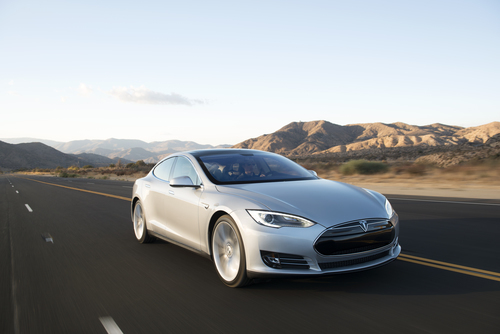 At the same time as all that happened, Tesla Model S owners discussed online a plan to replicate Broder's drive. Six Model S owners gathered at the Washington D.C. Tesla Store on Saturday morning (Feb 16) and were seen off on the trip by 30 people. While most of the Model S owners started at the Tesla Store, one drove down from Boston the night before and met them at the Newark Del. Supercharger station, joining them for the full drive northward. They organized a twitter account into which the participating Model S's were configured to tweet telemetry data about state of charge and charging sessions during the trip. Additionally they posted on the Tesla Motors Club forum, a YouTube account, and individual blog posts. The plan was to recreate, as much as possible, John Broder's trip including an overnight stay at a hotel in Groton Conn.
One issue with Broder's trip was the weather, and a question of whether cold temperatures caused the failure of his trip. Daytime temperatures tweeted by the participants hovered in the mid-30's (F) all day, and conditions were snowy. The drivers kept cabin temperatures at a cozy mid-70's (F) during the full trip, and never had to start limping down the road to preserve energy. However, going by the telemetry on Twitter they configured the cars for a 100% recharge, while Broder configured his car for a 90% recharge. All made it to the Milford Conn Supercharger station without incident, and were seen by twitterers along the way. After a stop to recharge the cars and dinner at a nearby restaurant, they continued to a hotel in Groton. The estimated range remaining arriving in Groton was about 185 miles. Overnight lows were about 20 degrees F, which is slightly warmer than the temperatures Broder dealt with, however the next morning the drivers had plenty of range to make it back to the Milford Supercharger station. While some of the drivers plugged into 120 volt outlets to trickle charge overnight, some did not. One did not, reported a 196 miles range the night before, had 169 miles of remaining range the next morning, and arrived at the Milford Supercharger station with 72 miles remaining range, according to tweeted telemetry data. While he did lose a bit of range to the overnight cold, by ensuring a full recharge the night before he had plenty of energy to make it back to the Milford Supercharger station. What to make of this? We observed before that Broder's fatal mistake was to charge only to 73% at the Milford Supercharger station, leaving himself with insufficient driving range. These Model S drivers ensured they had recharged fully, and had plenty of range despite having some range loss due to the cold weather. This doesn't prove whether Broder purposely sabotaged his trip to get a controversial news article. What it does show is that Broder's mistakes caused his trip to fail. Broder could have approached this with "mea culpa, mea culpa, I failed" but he didn't. NY Times editor Margaret Sullivan wrote a blog post Monday morning after having interviewed John Broder and many other people. Her conclusion is that Broder did not purposely fake the bad result, but that he showed bad judgement along the way. Love that @teslaroadtrip is confronting poor journalism using the power of social media. @elonmusk can't fight the fight alone.